Mumbai: We often find ourselves laughing at a child’s innocent statement even in the most serious situations. Their unfiltered way of thinking and carefree attitude is something we all miss as we grow up. 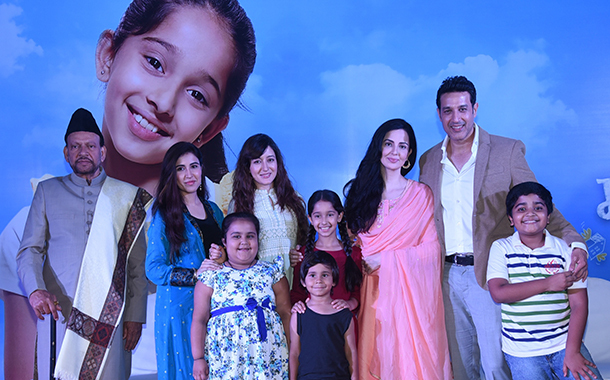 Star Plus’ newest show, Mariam Khan – Reporting Live brings forward the untamed innocence of a young girl, Mariam Khan. Mariam Khan – Reporting Live is the story of 8 year old girl, Mariam whose quirky take on life with her unfiltered creative mind will take you on a ride straight back into the uncomplicated younger days of your life. All of 8, Mariam’s creative imagination will have anyone in splits at all times. As adults, everyone tend to state the obvious in our answers to questions, but, Mariam can lighten up the spirit with most unexpected responses to anything under the sun. Mariam played by Deshna Dugad is the youngest member of the Khan family. On the outside, one may find the Khan family to be a regular family with a patriarchal grandfather, parents and their three daughters but what makes this family stand out is the fact that the audience will get to see them through Mariam’s lens. Her animated filters on her family members and her quirky sketches of them in her book define her world, Mariam is candidness personified. While Majaaz gives wings to Mariam’s innocent aspirations, her mother Madeeha worries about the future of her three daughters. Llook at the world with a child’s eye will always look beautiful and a little too animated too. Produced by Somersault Productions, the show will bring together an exciting cast including actors like Sheena Bajaj (Meher Khan), Priyanka Kandwal (Mahira Khan) and S M Zaheer (Aijaaz Khan). Astounding actors like Lubna Salim, Avinash Kumar, Rajeev Kumar, and more will also be seen as important characters. On a musical note, Neeraj Shreedhar will be making his television debut by lending his voice for the title track of the show. Star Plus is set to launch Mariam Khan – Reporting Live from 21 May, every Monday to Friday at 7:30 PM.